It wouldn’t phase me if someone called me a “helicopter parent” or gave me a frosty stare; however, said person should expect to be ignored. During the time period when I completed a teacher training programme, I spent a day observing at a school where a child – within the previous year – had died due to an accident in the playground. This story left a deep impression on me related to what can go wrong in a playground. I always said that my most important goal as a teacher was to return children to their parents at the end of the day in the same shape in which they arrived. (Accepting that there would be the odd scratch or non-serious bump that can happen). When I see or hear conversations about the role of adults in playgrounds, I always lean in to listen. Have you ever noticed how a younger child could walk across a clear surface, fall and hit his/her head on the floor at precisely the spot on the forehead that tends to swell up? Unexpected incidents can happen on playgrounds. An older youth could take a tumble off of a low ledge and break an arm. As educators, the next line of protection is to have staff members with sufficient safety training, and awareness training for all staff members so that they will know how to respond. There are also many other considerations, planning requirements and actions that are taken before children are supervised by staff members. As a parent, my approach towards outdoor playground time is a combination of supporting opportunities to enjoy the outdoors (inspired by the Outdoor Education/Play movement) and being conscious of safety and supervision needs. My children are active twins who enjoy being outdoors. Now that they are five, they are even more active and problems can occur. The excitement or emotion of the moment can jump the cue in front of reason and consideration of past experiences and realizations. Some incidents happen without warning. However I will tell my child to drop the stick that is being waved around in the playground every time. Yes I am one of those “no fun when it comes to stick usage” parents. I don’t have anyone in my sight right now as a potential helicopter spotter. I’m just throwing out a “hypothetical”. The term “helicopter parent” gets bandied about a lot these days as if the concept that is being described is a new idea. It also seems that this label is often dropped on parents who are strangers to the person making the claim. How well informed and unbiased is this judgement? I grew up at a time when children, supposedly, ran about for hours on end – unsupervised. Or at least that’s the trending story. I propose that the reality was different. When I talk with parents of today’s adults who are making these claims, and sharing Good Ol’ Days memes on social media, I hear a different story about what happened then. These parents weren’t all – as comic sketches suggest – hanging around kitchen tables and smoking copious amounts of cigarettes while they sent their children off to play all day. I recall different back stories as well. Parents can establish their own expectations but let’s not base them on sketchy details from 40 years ago. When you consider the wide variety of parenting philosophies that are used, there will be parents who will not like my approach as a parent. They’re welcome to their opinions but they need to keep them within the confines of their private conversations. How should we respond to a claim, shared online, that a parent was almost “breathless with terror”. Really? How do we measure that emotion in someone else? (See Related below.) Maybe that parent was completely calm inside. Maybe, if that parent really did “blow a gasket” and “almost” let the terror take hold, then that borderline state of being would be full-on evident. Writing posts on websites which probably won’t be read by a parent who inspired the post can present as passive-aggressive. At a minimum we can say that it is an example of publishing an unbalanced representation of facts that is tipped in favour of the author. This is particularly the case when one or perhaps scant few parents inspire a general post that, in real terms, is based on observations of a few people. There is no recourse for the subject of these posts to share their side of the story. 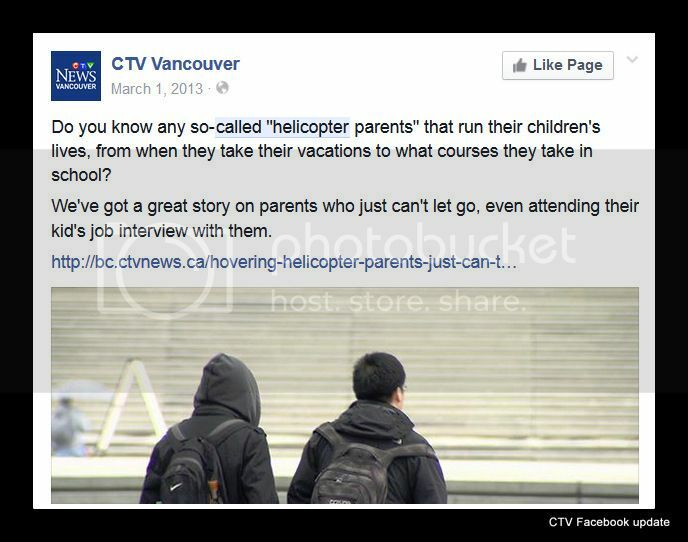 Helicopter parenting stories have been popular online and in the mainstream media for a few years now. They should have peaked in popularity but it seems the assessments are still rolling in. Since the blades are – we’re told – still spinning, let’s take time to unpack these stories more deeply. The first sign that this type of news item has run its course and is losing its currency happens when people start to push back. I’m feeling the push back. Are you?